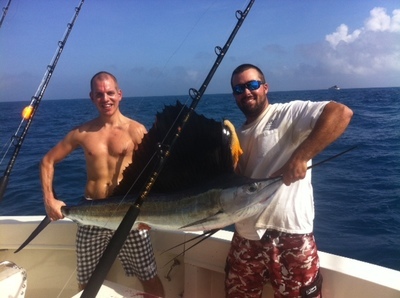 Late November has proven a close replica of last couple of years of Ft Lauderdale fishing catches. We spoke hopefully of a push of Sailfish into our area in this forum very recently and the last front has given us just that scenario. We had the pleasure of having Roland and Sharon aboard the Marlin My Darlin this morning as we steered slightly south and offshore of our inlet and began the charter in 140 feet of water. Very strong winds on the front shut us down for two days and as the seas died down to a reasonable level we along with all the boats in the fleet were ready to get offshore. An ocean of 3 to 5 feet was waiting with blue water and north current of less than one knot. A bit on the larger size on the wave situation but very fishable with clean blue water and slight north current which is often a home run on the back side of a front. Good kite flying weather as we say, and it was. Nice sized Mahi- Mahi running right along the reefline chasing flying fish and some Ballyhoo getting their attention as well. They were very aggressive and were all over our kite baits today with no hesitation. Skipjack and smallish Blackfin tunas in close with the current and clean blue water. And some Sailfish as well as you can see the largest Sailfish fish of the day brought aboard for a quick photo before a release with Roland and 1st mate Brian. Good to see the Mahi so close to shore and of course the Sails as well. We expect the Mahi-Mahi to be fairly regular but they may slide further offshore. If the sailfish follow their pattern of the last couple of years they will only stay with us for a short while and then we will be back to a slow pick. But that’s OK, we’re pleased to see some numbers as expected for now, there will be some Wahoo, and some big ones at that. Kingfishing is slow, Snappers biting well.